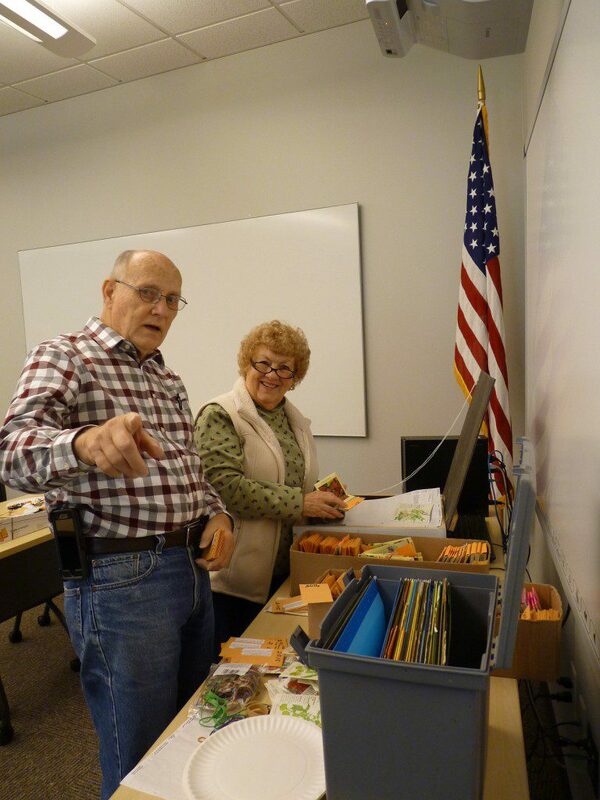 The Cherokee County Extension office with support from the Master Gardener Extension Volunteers collaborated with the Sequoyah Regional Library system to open a seed library at the Hickory Flat Library on March 8, 2016. The library, which is a retro-fitted antique dresser is filled with flower, herb, and vegetable seeds. 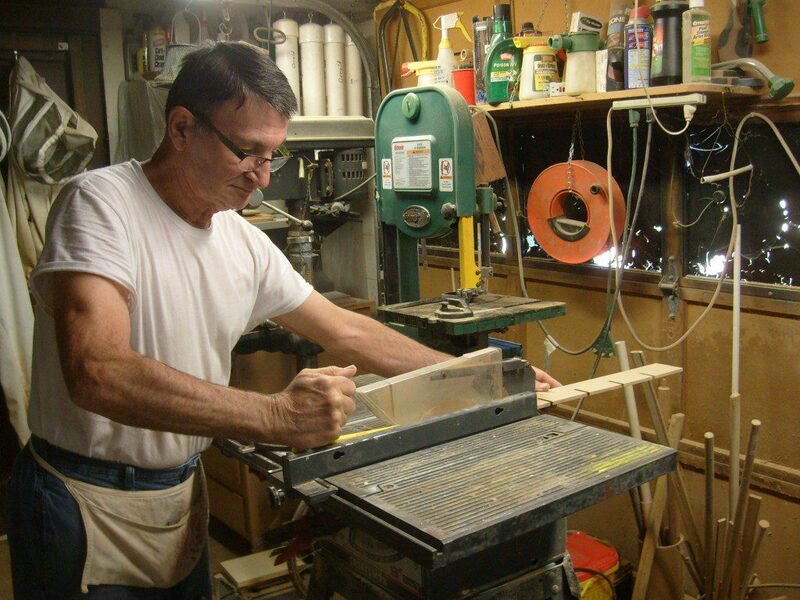 Gerald seen here working on finishing the dividers that were installed inside the drawers of the old dresser. Seed saving is a time-honored tradition that allows the selection and perpetuation of plants that have particular value to a gardener, whether it is an especially early and tasty tomato or an especially vigorous and drought adapted hollyhock. One such variety was shared with the library by Mr. James Satterfield. Mr. Satterfield is 83 years old, but you would never guess age by the beauty and fullness of his garden. Mr. Satterfield learned about the seed library through a normal visit to the library and was immediately drawn to the concept of sharing seeds with others. Mr. Satterfield has shared a number of varieties with the library but one hollyhock has a particularly interesting story. The hardy red hollyhock he calls “Rachel” came from a trip he and his wife took to England some years ago. They stayed at St. Gregory’s bed and breakfast in Hoveton, England where these beautiful hollyhocks adorned the grounds. The seeds made the journey back to Georgia and years later they received news that their hosts daughter, Rachel, had passed away from cancer. Since then Mr. Satterfield has referred to the hollyhocks as “Rachel” in her honor and said that he shares the seeds with anyone that is interested because they are such a beautiful plant. 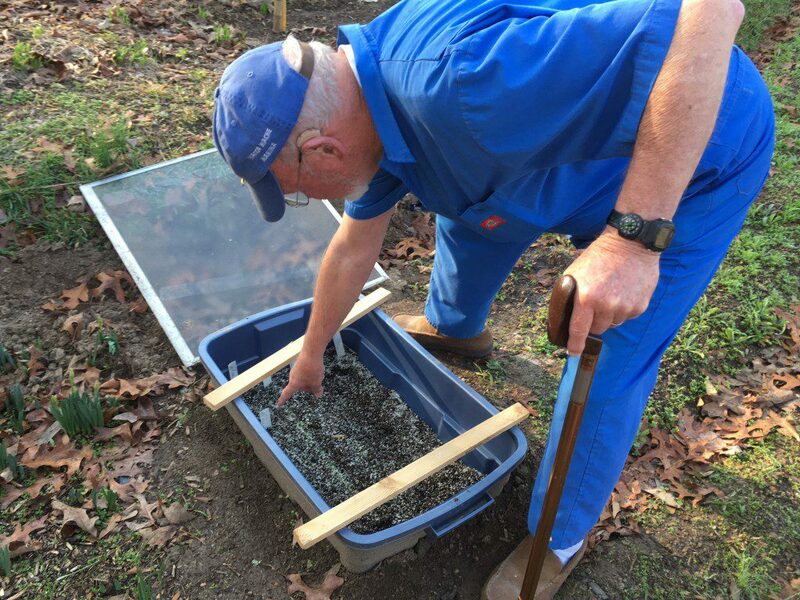 Mr. Satterfield is showing off some of his early starts in his practical cold frame, which is a plastic storage bin buried in the ground with a window over the top. The seed library is free to the public and interested gardeners are simply asked to fill out a membership form when they check out seeds. Since it’s official launching the seed library has seen 80 people fill out membership forms and borrow seeds, some from over 40 miles away in neighboring counties. “The seed library has been a wonderful addition to our branch and we know it has brought in new patronage to the library,” said Rhonda Broome, Hickory Flat Library Branch Manager. The initial inventory of seeds was collected from a number of master gardeners and the Cherokee ANR agent. Additional seeds were donated by the Seed Savers Exchange and Botanical Interests seed company. The seeds are organized by difficulty of seed saving and borrowers are asked to return some of the seeds from their successful plants at the end of the season. As growers deposit seeds the seed library will maintain its inventory and will contain plants that are better adapted to growing in our unique growing environment. Russel Brannen and Lynn Knotts are having a great time packing seeds with fellow Master Gardener Extension Volunteers for the 2017 growing season. The project is a natural fit with Extension programming. Extension developed two tri-fold brochures on basic seed saving and how to use the seed library. The location at the Hickory Flat library was chosen as the initial site due to its central location in the county but also because this library is where we host the majority of our public seminars. The seed library has created a great deal of interest from other library branches in the county and there are plans to start a second seed library at another location this year. Posted in Cherokee County, Flowers, Herbs, Home Gardening, Master Gardeners, Seed Library, Seed Saving, Vegetables. This entry was tagged local projects, master gardeners, Seed Library. Bookmark the permalink.